As part of Frank Lee’s ongoing leadership seminars here at OpenSesame, he hosted a session on emotional intelligence. Emotional intelligence is defined as “the ability to identify, assess, and influence one’s own feelings and those of others.” Emotional intelligence, or EQ, applies to everyone – it can help you strengthen relationships, understand others, and succeed at work, especially in leadership positions. First, EQ involves understanding your own and others’ emotions. By doing this, you can better communicate your feelings and understand others’ true meanings. Use your understanding of emotions to guide your behavior and thinking. After successfully identifying emotions, you should harness and use those emotions to better yourself and others. Not only can you be more honest with yourself, but you can prevent too much self-negativity. 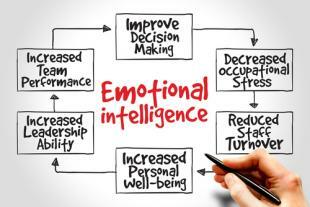 How can emotional intelligence make you a better leader? As you advance in management and leadership at work, you interact and manage more and more people. As a leader, EQ can help you solve a multitude of problems. Invest in yourself: Take care of yourself before helping others. If you’re too stressed or upset, your negative emotions will only have an adverse impact on others.